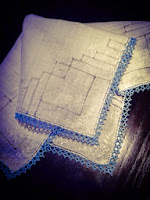 Another project in the WIP pile is this wedding hanky. The idea that a bride must have something old, something new, something borrowed, and something blue....this will have all covered except the borrowed piece. A vintage hanky with newly tatted blue edge will begin as a base for the rest of the piece. I finished the first round this morning after a year on hold. I'm a bit rusty on several things as a result of my hiatus with several mistakes on the corners....I have no clue what I was thinking. AND, I need to review how to join last to first...., other than that, it's fine and DONE. The blue pass is a base for the first round of white rings and chains. My hope is that I can drop a few rings and chains down each corner to make it quite ruffled. Any thoughts on this? As I am a collector, I have a huge stash of vintage hankies. My goal is to tat a wedding hanky each year. But, for now, must get ready for another day of jury duty..... (The judge actually warned the jury there was to be no knitting.....he didn't say anything about tatting......). How sad that the judge said no knitting... apparently he doesn't know that repetitive motions such as knitting can help one focus... at least that's what I think! I like your idea of a wedding hanky a year. I have quite a few hankies that could benefit from a beautiful edging. 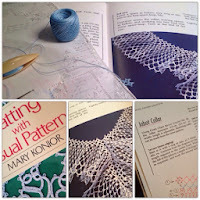 I have had the best laugh of the day perhaps the judge does not like knitting, do take your tatting he might learn what tatting is? Perhaps he does not like the cracking of the needles. I don't have a huge stash, but I have a pile of hankies from estate sales. I do plan on tatting on them, how do you attach tatting to a hankie that has a finished edge. I can sew and could use a hemstitch needle and put holes in it. Would you do that? The comment about the judge saying no knitting was quite funny, because I had an extended Grand Jury visit, and tatted snowflakes for everyone on the panel (it was around Christmas). Hello to my cyber tatting friends! !